[Conductor and Founder] Jay Fishman has an ongoing commitment to make high quality symphonic music accessible to my East Side of Saint Paul community…. First Covenant Church of Saint Paul has been honored to host Sinfonia concerts [since] 2002. People of all ages, from young children to senior adults, fill our sanctuary for these concerts. Our hearts and minds are filled with the wonder of music from talented musicians in the Sinfonia orchestra. In addition, when fewer and fewer resources are going to the creative arts for our young people in St. Paul Public Schools, Sinfonia fills a gap by bringing the arts to the school, and to our students–without cost to the school. Amazing! As a resident in the community I have benefitted from the summer concerts at Lake Phalen. Amidst all the challenges our community faces, we can gather at the park on a summer evening and escape from the challenges we often face and instead be drawn together by the wonder of music. This is such a gift to an urban community such as ours. Jay’s passion for music and for the audiences he serves is evident in the energy he brings to conducting and in his tireless work ensuring these concerts continue for communities such as mine. 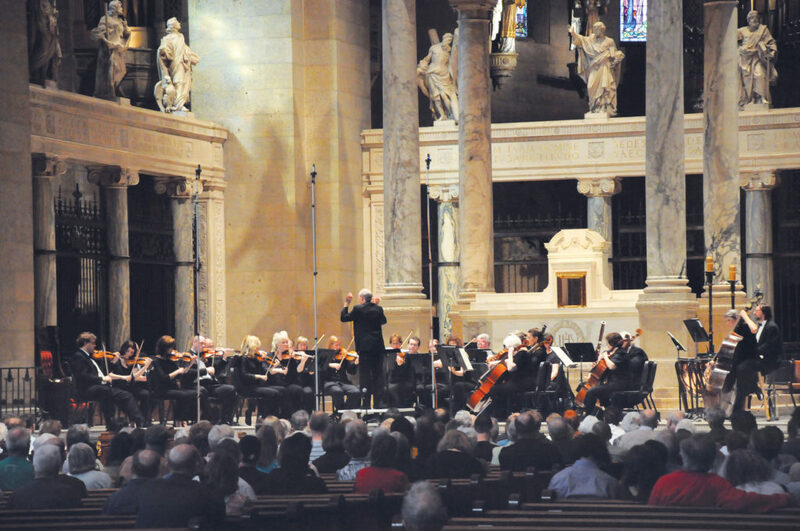 Since the Minnesota Sinfonia was formed in 1989 The Basilica of Saint Mary has been pleased to host three to five concerts per year. Prior to 1989 The Basilica also worked with Jay Fishman and the Minneapolis Chamber Symphony to present performances each year. All of these concerts were free, open to the public, and accessible to people of all ages, means, and abilities. These high quality, professional performances have played an important role in fulfilling a component of The Basilica’s mission by contributing to the celebration of arts in the community. We are proud of our association with Jay Fishman and the Minnesota Sinfonia, and are grateful that it has helped us to celebrate the arts in our community. We look forward to collaborating with them long into the future. 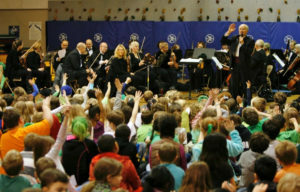 [As] the principal of Clara Barton Open School in Minneapolis for 20 years until my retirement in 2012, … our school community had the wonderful opportunity to work closely with Jay Fishman and the Minnesota Sinfonia…. I can say with great confidence that the Minnesota Sinfonia program was exceptional in its commitment to depth and high quality learning for our students, at all age levels. We usually had many parents attend the concerts so that, even with two separate programs to accommodate our kindergarten through eighth grade enrollment, our seating area was packed. And seeing the student musicians perform alongside the professional musicians was always inspiring, to our faculty, our parents and to other students. We measure a lot of things in our public schools today. The reality, though, is that some of the most powerful learning experiences for our students are in areas that are beyond our ability to measure well. Our experience with Jay Fishman and the Minnesota Sinfonia certainly fits into this arena. Arts learning can be transformative when done with thoughtfulness and integrity. The Minnesota Sinfonia experience comes as close as any I ever witnessed as a principal to stretching and inspiring students, as well as the larger school community, to finding the joy and power in high quality music. It has been a great honor to have Mr. Fishman and the MN Sinfonia performed with the orchestra students at Farnsworth Aerospace School. This wonderful opportunity provided insight on how a professional orchestra will sound like if students continue practicing and if they wanted to pursue this endeavor as a career in the future. It also has been very helpful for students to hear the different techniques that Mr. Fishman share with students to improve their playing ability and as well as their sound. By having an all-school assembly it encourages and attracts more students to join orchestra at our school. Thanks again for this wonderful opportunity! I have deep respect for Jay and his work for the Music in the Schools program because he does it for the love of it . He brings music to underserved populations of students because it makes a difference and not because it is glamourous. He has led hundreds of performances for schools and is relentless in sharing his passion with urban kids. He is genuine as he interacts with the students and he is teaching them; he goes far deeper than the basic value of performance for entertainment. His rapport with the musicians is one of good humor and hard work. Many of them have been with him for several years; even decades, which speaks to his personality and dedication. Minnesota is alive with the Arts! The Twin Cities alone boasts dozens of professional theaters, musical groups and art galleries. One can spend every day of the week exploring new experiences. For many Minnesotans, this is not a possibility because of financial difficulties, transportation and accessibility issues. Jay Fishman has worked for decades bringing the magic of classical music to a diverse audience with the Minnesota Sinfonia. [Minnesota Sinfonia’s] community concerts bring world-renown soloists and top-notch performances to our audiences for free. In my many years as a professional musician, I know the Sinfonia is very lucky to have the talent, respect, teamwork and comradery that have been cultivated by Mr. Fishman over the years. With his unique talents, he has built an organization that serves Minnesota audiences and musicians in a way most artistic groups do not. Sinfonia musicians are grateful to have him at the helm! I have been the concertmaster of the Minnesota Sinfonia for over 30 years, and in all that time, Jay Fishman has never ceased to amaze me with his dedication and passion for the orchestra. Jay has always believed that everyone deserves the opportunity to hear great music, so he created the Sinfonia to perform free concerts for everyone. The orchestra has now played hundreds of free concerts in Minnesota, sharing classical music with thousands of people that would not have otherwise had a chance to experience it. The orchestra is an invaluable part of the community, and it would not exist without Jay. …We have had the privilege to play with some of the world’s best musicians, and this would not be possible without Jay’s commitment and stellar reputation. I had a pleasure and a privilege of performing with Mr Fishman on more than one occasion. Mr Fishman is a highly accomplished performing artist with encyclopedic knowledge of music, outstanding leadership qualities as well as tremendous communication skills and personal charm. His successful career and a great many personal achievements speak for themselves. Jay, I’m pleased that you’re pleased! You afforded me one of the most memorable, positive, musical experiences in my life! [you] made sure that every aspect of my musical experience was absolutely top-notch. Thank you very much for spending time with me today to discuss my music. It has been many years since I’ve been given such concrete and helpful advice about my compositions. Most judges will never take the time to encourage composers to contact them, but it actually is a real service to the composers. I appreciate it and am sure it will make a positive difference as I go forward. Thanks again. Thank you, and your wonderful musicians, for your hard work and fine performances of my new work, “Sacred Geometry for Chamber Orchestra.” I appreciate that you selected my work to be premiered via the grant initiative through sponsorship of the McKnight Foundation. I also appreciate all of the help you provided me in modifying some aspects of the score for increased playability. It was terrific to be invited to the last two rehearsals, as well as to attend the premiers in St. Paul and Minneapolis! Thank you for providing me with an opportunity to speak directly with the musicians about some aspects of the piece during the 2nd rehearsal. Several of the musicians told me that my comments were helpful to them. …Getting the opportunity to play amazing music with professional musicians showed me what being a professional might be like. …I learned a lot about how to lead the rest of the section by cueing, etc. …How to really hone in on details to play the best that we could. …I learned how professional orchestras operate and I got the opportunity to play in an actual orchestra (something I have never done before). …You can be professional as well as laid back and ready to have fun at the same time. …I got better every night. I liked working on it with supportive professional musicians, and the student musicians were just as supportive and collaborative. My technique has improved, as well as my ability to prepare and practice efficiently.